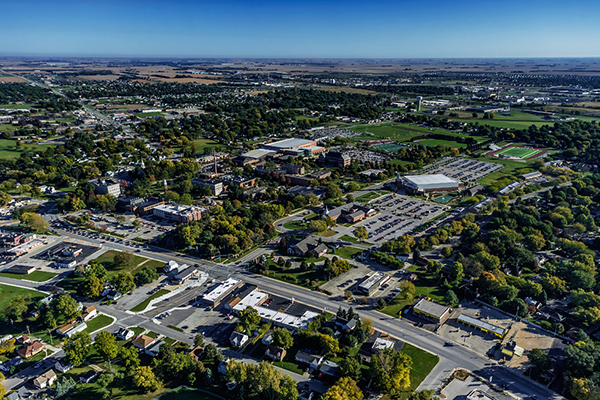 Olivet Nazarene University is centrally located in the historic village of Bourbonnais, Ill., within the beautiful Kankakee River Valley. The local community offers several choices for shopping, restaurants, recreation and more! Students don’t need to go far to stock their refrigerators, purchase supplies or update their wardrobes. Shopping centers and popular retail stores abound in the Bourbonnais area. On a sunny day, students enjoy walking to the local café or sandwich shop to eat lunch with friends. And don’t forget Dairy Queen on the way back — it’s directly beside the campus! Many students enjoy jogging, biking and rollerblading at Perry Farm, less than a mile away. The more adventurous frequent the Kankakee River State Park to hike, climb, fish and camp. Olivetians also enjoy attending many cultural events in a variety of venues, including concerts, plays or musicals provided by the Kankakee Valley Theatre and the Kankakee Valley Symphony Orchestra. And with three movie theaters, a bowling alley, and an ice skating rink, students are never at a loss for things to do.